We have had some recent success with the Oculus DK2 drivers and today are releasing a new RedFrame environment demo, available for download from the links below. This demo features the library, a key location in RedFrame and a nice companion to the master bedroom that we had released for DK1 last year. This is a slightly smaller environment (we don’t want to give too much away), but it contains some hints about what's to come. I've included some of the new rendering techniques featured in my last post, Experimenting with Unity 5, which look very good in VR. Before playing, be sure to specify your height and IPD in the Oculus Config application included with the Oculus Rift Runtime. The RedFrame environment is precisely modeled to scale which can magnify discrepancies in your virtual height. We’ve also included a “seated mode” (see controls below) that will approximately match your height when sitting in a desk chair, greatly increasing both immersion and sense of scale. On Windows, change your Oculus settings to use "Direct to Rift" mode instead of "Extended" mode, and run the Direct to Rift app included with our demo. Don’t mirror your display, it causes bad jitter. Update your graphics drivers after verifying that they're compatible with your Rift. If the frame rate doesn't feel smooth, relaunch the app and select the lower quality setting. The two presets we've included should perform well on most computers. If your screen goes black, it may be because your head passed through an object. This is a feature we added handle collisions with head tracking. If the screen shows up tiny in the corner, make sure the resolution is set to 1920 x 1080 on launch. Sometimes with the OSX build, the cursor won't hide. If this happens you can just drag it to the top of the screen. Since this is still a work in progress and far from perfect, if you have trouble please let us know about your experience. Your feedback is very helpful! Unity 5 has added some really cool lighting and shader features to help artists create more realistic looking scenes. A lot of this is coupled to their out of the box set-up, but it is pretty easy with Unity to write new shaders that take advantage of this new lighting model. RedFrame has traditionally not made much use of of specular lighting because it required using dynamic lights to add the spec highlights. This slows things down a bit since the scenes have hundreds of thousands of polygons. However it seems like using Unity’s reflection probes is pretty cheap and can help mimic all sorts of real surface types. As an experiment, I wrote a shader that takes the light map as the diffuse contribution but also has specular and occlusion maps that can interact with box-projected reflection probes. The below video shows the library using this technique on some of the surfaces. There is one dynamic point light in the center of the room to add some more vivid spec highlights, but this is running at a few hundred frames per second with 8x anti-aliasing, so it is a good sign. For the past five months, Mike and I have been carving out a significant portion of our schedule to work on RedFrame. We’ve made great progress on several fronts. Mike has been working on the main code base, building a robust infrastructure that is now allowing us to set up puzzles and interactions that previously had been held together by ad-hoc prototype code. The types of interactive elements available in the game are very well known at this point so we’ve been able to front-load this engineering work. During this same time period, I have migrated the entire house to new, cleaner, Maya files, and in the process have greatly improved much of the texturing and quality of models. I’ve also finally been able to get around to working on an area that I had put off for a long time: the yard. Happily I feel that this is now one of the best areas in the game. I’ve also started work on the other environments outside of the house and am planning them out in broad strokes. All of this work has been aimed toward building our first demo with interactive puzzles which will continue to grow out into the final game. As we begin winding down some of these time consuming programing and art tasks, I will return to puzzle design and Mike will be freed up to work more on environmental storytelling. There will be a lot to share with you this year and we’re very excited to show it to you. Thanks for the support and stay tuned! Recently Mike and I had the pleasure to speaking with Cris Miranda who hosts a podcast EnterVR. We chatted about RedFrame as well as VR in general. It was a lot of fun and we were able to verbalize a lot of things we had been thinking about with the game as well as other projects we'd like to do in the future. It's been a while since we posted anything about RedFrame - we took a short break to avoid burnout, and have been creatively re-energized by focusing on other work for a while. We're gearing up to do a lot of work on the game in 2014 and will have exciting new things to show you. To kick off the new year we're releasing our first Oculus Rift demo in which you can experience one small piece of our environment, the master bedroom. Both Mike and I have Oculus Rift developer kits and have been very excited to see the RedFrame environment in VR. In fact, VR is such a qualitatively different experience that we're adjusting many of our design decisions to better support it. RedFrame feels like it always was meant to be a VR experience, and the technology has finally arrived to support it! This demo is intended to provide the general flavor of the experience that we want to create, rather than demonstrating gameplay (there are no puzzles or interaction). We've also included a new track from our musician, Notious, who has been creating wonderful compositions for the game. You can check out his other work here. The RedFrame Oculus demo is best experienced with a gamepad. We support Xbox, PS3, and PS4 controller on every platform. Before playing, be sure to specify your player height and IPD in the Oculus Config Util included in the Oculus Rift SDK. We've also included a "sitting mode" that simulates your height while sitting in a desk chair. We've found that this greatly improves realism by matching the floor that you see the floor that you feel with your feet. We haven't really used or needed a lot of plug-ins for RedFrame thus far, however there is one we started using that is pretty incredible. Amplify Texture is a plug-in for Unity that allows textures to be streamed into your game dynamically. What's cool is that it only streams the visible parts of a potentially massive virtual texture, which contains all the textures you add to it. Consequently the scene loading time is negligible and you can have one Virtual Texture for each scene, making it virtually unlimited. A few weeks ago, I was working on puzzles and prototyping some tutorial like gameplay while Mike was working on environmental story ideas. He asked me if I had gotten very far testing Amplify, as we had talked about using it in the past. I hadn't really tried it out seriously but Mike had realized that a lot of his environmental story ideas would benefit from very detailed textures. For example, someones name carved in a wall or scuff marks, the kinds of things maybe only Sherlock Holmes would notice at first. There where obviously other reasons to look for a good texture solution, we use tons of light maps and also have dozens of paintings, all of which are severely hurt if they are displayed at at small size. There were also performance reasons, once all the textures, sounds, and 2 million triangle house are put into RAM, there is not a lot of room for high resolution light maps. My previous solution was to load and unload light maps based on them coming into visibility while frustum and occlusion culling were running. This was an adequate solution but messy and not necessarily scalable. We also weren't getting great performance on older hardware, this was expectable but not ideal. I knew we could get the game to run fine but didn't enjoy having to thread this needle, it would be much nicer to just work freely. It's hard to except that there is now such a good solution but early tests seem to indicate that it is so. The current version of Amplify doesn't support light maps, however, because texture memory is not much of an issue, I did a test where I simply baked light and color all into one huge map with no need for repeating textures. I can also bake hi-rez normal maps into this map so the level of detail is pretty stunning so far. As you can see the first tests are pretty promising and I look forward to continue testing this plug-in moving forward. You can learn more about Amplify Texture here. For anyone who doesn't know, we're building RedFrame using the Unity game engine. Unity is a wonderful tool with many features that make it appealing for indie development, including the ability to deploy to multiple operating systems as well as an amazingly simple asset pipeline. The folks at Unity were kind enough to feature our game on their site, and we recommend checking it out if you want to get a little more background on the project. We have been a bit tight-lipped so far and hopefully this is a good introduction to who we are and what we would like to accomplish with RedFrame. Check out the article! As we craft the puzzle structure for RedFrame, it's very useful to have a birds-eye view of the environment so that we can better see how puzzles physically relate to one another. I spent some time over the weekend creating a simple Unity editor script that allows me to export two very large screenshots, one for each floor of our house environment. The script creates a new downward-facing camera, sets it to orthographic mode, and adjusts its near and far clips planes to cut out only the vertical section of the house that I'm interested in. It then manipulates the camera's projection matrix to produce an oblique projection. This oblique perspective makes it much easier to see walls and determine height, and has the fun side effect of making it feel like a top-down RPG. Rather than capturing an image with Unity's built-in Application.CaptureScreenshot method, I instead chose to render to a much larger off-screen RenderTexture with a square aspect ratio. This way I can guarantee that the resulting images will always be the same dimensions, regardless of how the Unity editor windows are set up. I combined the two floor images in Photoshop as separate layers, and gave the top floor a slight drop shadow. I can easily toggle between the top and bottom floor by hiding the top layer. I've created additional layers in which I can create diagrams and notes. As the environment evolves, it'll be very easy to re-run the script in Unity, producing a new pair of screenshots that can be dropped into the same Photoshop file. 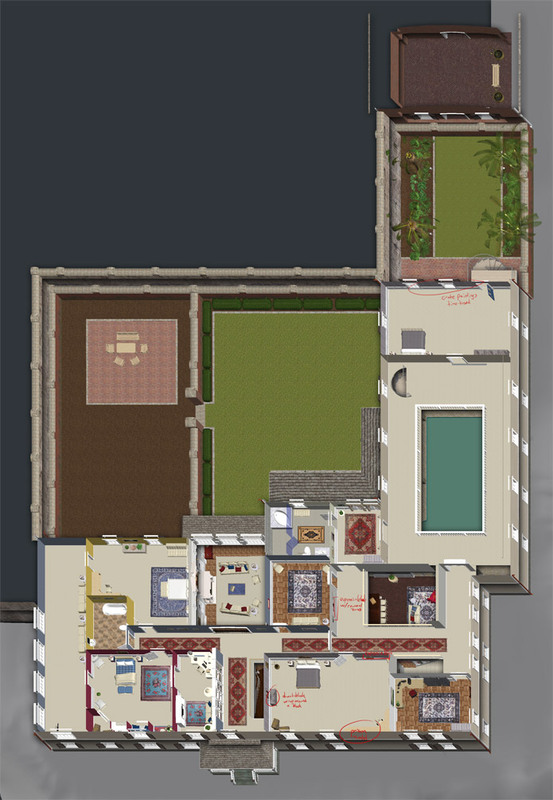 You can download my floor plan screenshot script here. It was written very quickly, so if you see room for improvement please let me know! A few months ago I finished building and lighting the the RedFrame house environment. Not including bathrooms, the house has 17 furnished rooms, and a couple outdoor areas. The general look has changed a lot since we last showed a demo. I've started to use higher contrast in many areas, and the general color scheme of each room has converged into a unified style, making each room feel unique. Here's a quick tour of some of the areas that convey the main feel of the game. It's always a little sad to see good code slip into obscurity as gameplay changes and mechanics drift from their original goals. During our lengthy exploration into RedFrame's core gameplay, a lot of our ideas reached a fairly playable state, only to be discarded once we embarked on our next prototype. But all is not lost; by diligently using version control (SVN - that's for another post) we've retained a complete history of our creative and technical output. I'll often pursue old systems to remind myself of previous ideas that may become relevant again some day. One such forgotten system was an object carrying mechanic that I developed about a year ago. The system offered some neat affordances for both the player and the game designer: the designer could mark an object as "portable", then mark valid drop locations on surfaces. At runtime, when the player approached the portable object it would highlight to indicate interactivity, then they could click the mouse to pull the object into their hand. There could never be a case where the player could permanently lose the object, such as by dropping it behind a couch, because the designer would not have designated that area as a valid drop location. It was a great system, but it became a solution looking for a problem. We quickly ran into an interaction problem common to most adventure games: pixel hunt. It's a major failure of design when the player is compelled to click aimlessly throughout an environment in an attempt to discover interactive items. The issue is bad enough on static screens in point-and-click adventures, and a full real-time 3d environment only magnifies the problem. The system had to be abandoned - it just didn't work in the game. Fast forward a year. Just last week we realized we had a related problem: our core gameplay had been reduced to interaction with 2d planes (we'll talk more about this in future posts) and we'd lost the feeling of actively participating in this dense world we'd created. To avoid spoilers I won't reveal the precise nature of the solution we're currently exploring, but it turns out that my object pickup system was perfectly suited for the job. At this point I have a known problem, and I have code that can potentially solve it... but now how much of this code is actually usable? Luckily, the code came into our new project without any errors. In general, it's not uncommon for older code to have to be thrown away simply because it can't easily interoperate with new systems. When it becomes more work to fix old code than to write new code, you can become trapped by constant churn that will bog down even a small project. To mitigate this, I try to structure my code in a very decoupled way. This method searches for PortableObjects within a view frustum implied by the position and rotation of a given Transform object with a given angle-of-view. I chose to require a Transform rather than a Camera component since it can't be guaranteed that our solution requires us to render a camera view. It's generally best to require only the most generic parameters necessary to perform a desired operation. By artificially restricting the use of a method by requiring unnecessarily specific parameters, we harm future code re-use without adding any value. Technical - It's possible to swap two methods without re-working existing parameters, changing resulting behavior without having to track down new input data. This increases productivity while reducing the occurrence of bugs. Psychological - By using consistent parameters across multiple methods, the programmer's cognitive load is significantly reduced. When it's easier to grasp how a system works, and it requires less brain power to implement additional pieces of that system, the code is much more likely to be used by those who discover it. Lastly, the system includes a PickupController. This is a general manager script that manages picking up and dropping one object at a time, using the main camera as input. PickupController has no dependencies outside of the scripts belonging to its own system – it assumes nothing about the scene's GameObject hierarchy aside from the existence of a camera, and doesn't require any particular setup of the GameObject that it is attached to. It simply scans for PortableObjects to grab and DropNodes to place them into. By making the fewest possible assumptions, it's able to be included in just about any project without having to be modified. Writing re-usable code can certainly not be easy, but I've found that its long-term benefits tend to outweigh the cost of minimally increased development time. Once you're comfortable with writing reusable code you'll find that your earlier work will pay off again and again, making you more productive by obviating the need to repetitively solve the same problems. An in-game screenshot demonstrating externally baked linear space lightmaps rendered in Unity. RedFrame is meant to be a highly atmospheric and immersive experience. To create this atmosphere, it was important for us to focus on lighting. Many games have compelling lighting, however they tend to be outdoor environments lit by a single directional source representing the sun. 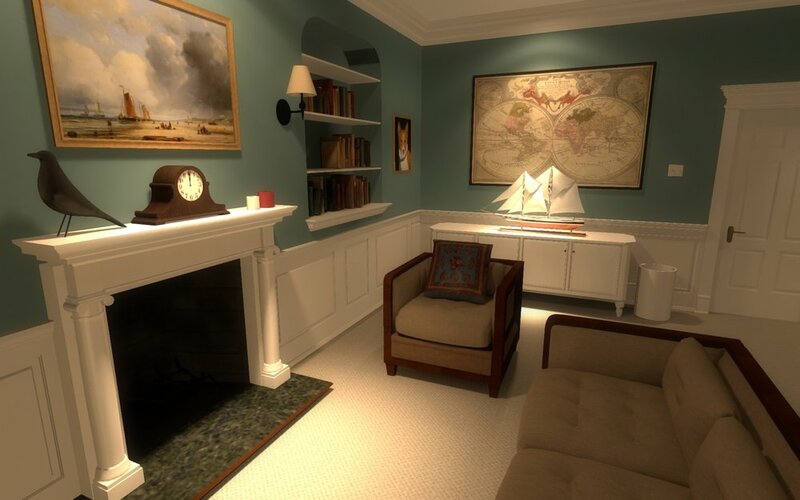 In comparison, we are creating a nighttime environment illuminated by lamps, sconces, and recessed lighting. I struggled for many months to achieve a look that I really liked. Hopefully what I have learned can be helpful to anyone trying to create something similar. It is important to note that we are using a lot of precomputed lighting with Mental Ray, which is not a viable option for games that have highly dynamic environments (which, unfortunately, is most kinds of games). Once you understand these concepts, you will have a non-software specific checklist to use in creating your interior setup. For many years working in 3d, I was told that real-world light had a quadratic falloff. This is known as the inverse-square law. Any energy that radiates out from a source in 3d space has an intensity equal to 1/(the distance traveled)^2. However, many lighting tutorials that I had read glossed over this fact, and instead suggested using a linear falloff which looked better. I always thought that this was weird since the quadratic falloff was physically correct. Naturally I tried using quadratic falloff which, to my dismay, resulted in too much contrast compared to the linear method. As you can see, quadratic light falls off much too quickly, and the light has extreme contrast. The linear option looked better, but it always seemed unnatural to me. It also bugged me because I knew that light obeyed the inverse-square law in nature, but this was for some reason incorrect. I have learned that it is generally not a good idea to ignore things that bother you. If you are doing everything correctly you generally won’t have the uneasy feeling that I experienced when setting my lights to linear. It turns out that the reason I was having this problem was that 3d software renders images mathematically correctly, but since it is displayed on a computer monitor, it is being viewed in Gamma Space. If you are unfamiliar with the concept of Linear Space vs. Gamma Space (as I was), I suggest watching this video. Because of the way in which a monitor displays images, an image needs to be adjusted before being output to the screen. This adjustment is often done automatically in many cases, like when a gamma correction value is embedded into a digital photograph. However, out-of-the box 3d rendering does not produce this correction for you by default. To set the rendered image's gamma correction in Mental Ray, you must provide the inverse of the most common output gamma value of 2.2. This is calculated as 1/2.2 which is about .455. In your Mental Ray render settings, input .455 into the Gamma parameter under the Frame Buffer section. As you can see, I am now able to use quadratic light falloff with less intensity and the light dissipates in a manner that is much more natural looking. Keep in mind that we are gamma correcting a final rendered image in Maya, but Unity is optionally able to render in linear space. In the future when we bake light maps, we will be able to render them in linear space and have Unity perform the gamma correction at runtime. Now that we have a correct light falloff, lets look at shadows. In the previous example the shadows were hard, meaning that any point on a surface is either completely inside or completely outside of a shadow. In the real world, light sources usually have a size, or diameter, which makes their shadows soft. If a light source has a diameter, the rays emanating from it will originate from different locations across its diameter. This will cause some of the rays to be occluded by the object casting the shadow, while others will not. As you can see in the above image, the rays originating from the outermost area of the light source are able to wrap around the object casting the shadow. As you move towards the center of the source, the rays become more and more occluded by the object. This effect will not be as extreme with something the size of a light bulb, but it is still present. Giving any light source a diameter greater than zero will make the shadows look more realistic. To set a light diameter in Maya, change the type of light to Area Light. Also, ensure that the decay rate is still set to quadratic as discussed in the section above. You will also need to check off a few Mental Ray settings: Open the Mental Ray Tab for your light object, then under the Area Light section, enable "Use Light Shape." I selected a sphere as my shape since that is a good approximation of a light bulb. You can also increase the number of samples for better quality shadows. As you can see in the above image, the shadows now have a more realistic and familiar look to them. So far, these examples have all used point lights which means that the light radiates outward equally in all directions. If we want to create effects that mimic the appearance of recessed lighting, we will need a more sophisticated distribution. Below you can see an example of recessed lighting that looks much more interesting than a standard point light. This effect is known as photometric lighting. You can recreate this type of uneven light distribution using something called an IES file. These files are available all over the web and are commonly made available by different light manufacturers. IES files are frequently used by architects in pre-visualization renderings, so they are designed to accurately reproduce the appearance of commercially available bulbs and fixtures. With a little bit of digging, you can locate some of these files to use as a profile for your light. I'm not sure about the legality of distributing them on this site, but a quick Google search should be productive. To hook up the IES file, open the "Custom Shaders" tab under the Mental Ray section of your light and click the checkerboard icon next to the "Light Shader." From there, click the Mental Ray Lights section and select the “mia_photometric_light” node. Under the node’s settings, set the intensity mode and distribution mode to 2. This will tell the light node to use the IES profile. Click the checkerboard icon next to the profile section, which will create a new IES profile node. Once the profile is selected, render out an image. As you can see, the distribution looks like a recessed light that you would see in a house. There are many different IES profiles available online that can create a plethora of effects. Note: Light Color section has been edited to use a blackbody node which doesn't need gamma-counter correction. The behavior of the light is starting to look pretty good, however the color is wrong. 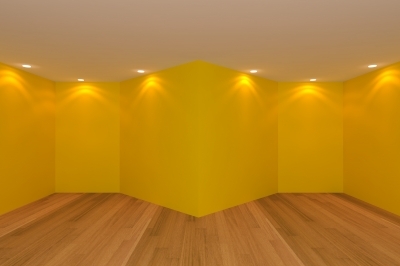 Lights in a house tend to have more of an orange color. A quick way to emulate this is to plug in a Mental Ray Color temperature node called a mib_blackbody. Plug this node into the color of your light. This node will let you select a temperature, which will generate a light color. I like values around 3,800 for indoor lighting. You can see a nice chart of color temperature here. Once set, you can render the image and see if the lighting looks more like an artificial light source. If it is too orange, try increasing the temperature. If you are unfamiliar with indirect light, it is worth doing a little research before proceeding with this workflow. However, the basic idea is that when light hits a surface, it bounces off and reflects onto other surfaces, some of which are in shadow. This means that the areas in our rendering that are completely black and in shadow should potentially still be receiving some light from other nearby surfaces that have received direct illumination. I use an incredibly simple setup for this. In your Mental Ray render settings, under “Indirect Lighting,” you can turn on "Final Gather." This is a method of simulating light bounce that works pretty well. Set the Accuracy to something like 500 and set the Point Interpolation up to 50. These are quick and dirty settings but should be sufficient for you to get the idea. Once it is set up, we can render to see the indirect lighting. Getting our lighting workflow ironed out was a difficult process, but in retrospect the steps are pretty straightforward. Keep in mind that recreating this exact workflow is not nearly as important as internalizing the concepts that I have covered. Many developers will be using different 3d software and, even more commonly, baking light directly inside of their game engine. These differences in tools will likely require significant changes to the workflow. Also, using an article like this as a direct template will result in a homogenous look. It is much better to understand why we’ve used these techniques in RedFrame so that you have more knowledge to draw upon when you approach the visual design of your project. Global state and behavior can be a bit tricky to handle in Unity. RedFrame includes a few low-level systems that must always be accessible, so a robust solution is required. While there is no single solution to the problem, there is one particular approach that I've found most elegant. Include the prefab in all scene files. Include the prefab in the first scene, and call its DontDestroyOnLoad method during Awake, forcing it to survive future level loads. Other scripts would then find references to these manager scripts during Start through one of a variety of built-in Unity methods, most notably FindWithTag and FindObjectOfType. You'd either find the game manager object in the scene and then drill down into its components to find individual manager scripts, or you'd scrape the entire scene to find manager scripts directly. A slightly more automated and potentially more performant option is to use singletons. The preceding code will create an object that persists between levels. Duplicate copies may be instantiated if the singleton had been embedded in multiple scenes, so this code will also destroy any additional copies it finds. If a MonoBehaviour references a singleton during its OnDestroy or OnDisable while running in the editor, the singleton object that was instantiated at runtime will leak into the scene when playback is stopped. OnDestroy and OnDisable are called by Unity when cleaning up the scene in an attempt to return the scene to its pre-playmode state. If a singleton object is destroyed before another scripts references it through its Instance property, the singleton object will be re-instantiated after Unity expected it to have been permanently destroyed. Unity will warn you of this in very clear language, so keep an eye out for it. One possible solution is to set a boolean flag during OnApplicationQuit that is used to conditionally bypass all singleton references included in OnDestroy and OnDisable. The order in which objects have their Awake and Start methods called is not predictable by default. Persistent singletons are especially susceptible to execution ordering issues. If multiple copies of a singleton exist in the scene, one may destroy the other copies after those copies have had their Awake methods called. If game state is changed during Awake, this may cause unexpected behavior. As a general rule, Awake should only ever be used to set up the internal state of an object. Any external object communication should occur during Start. Persistent singletons require strict use of this convention. While singletons are inherently awkward to implement in Unity, they're often a necessary component of a complex game. Some games may require many dozens of manager scripts, so it makes sense to reduce the amount of duplicated code and standardize on a method for setting up, referencing, and tearing down these managers. A generic singleton base class is one such solution that has served us well, but it is by no means perfect. It is a design pattern that we will continue to iterate on, hopefully discovering solutions that more cleanly integrate with Unity. We do all of our light baking for RedFrame on a beefy Mac Pro, but due to limitations in Maya and Mental Ray we have to run multiple instances in order to saturate the available processor cores. On Windows it's very simple to run multiple instances of a single application – this is the default behavior – but we work on OS X which only allows one instance of an app to be running at any given time. We've commonly used a messy workaround: duplicating the application on disk and keeping references to its many copies in the Dock. Using Platypus I bundled this command into an application that sits in the Dock, ready to spawn additional Maya instances on demand. Note: Lightmapping Extended is no longer compatible with Unity since the Beast light baking system has been removed from the engine. While investigating potential lightmapping solutions for RedFrame, we explored Unity's own lightmapping system which leverages Autodesk's Beast. Beast unfortunately is lacking a few more obscure features useful for simulating realistic artificial indoor lighting, most notably photometric lights for reconstructing the unique banding patterns indicative of incandescent bulbs installed in housings. This prevents us from completely switching our workflow from Mental Ray to Beast, though we'll likely still use Beast for specific locations in the game that are favorable to Beast's feature set. Beast is a quite a full-featured lightmapping solution in itself, however Unity's specific implementation of the tool favors simplicity over customization. Some very useful features are hidden away, and it's not immediately obvious how to enable them. To give Beast a fair evaluation, I needed to access them. Unity fortunately is able to accept Beast XML configuration files, opening up nearly the full potential of the system. There are a plethora of additional options recognized by Beast, but only a limited number are documented by Unity. After a bit of digital archaeology I was able to unearth documents that revealed the missing parts of the API. Keep an eye on the Lightmapping Extended thread on the Unity forum for future updates. If you run into any issues, please let me know either through the blog comments or the Unity forum thread. I'd like to make this the best and most complete solution for lightmapping inside of Unity. I recently published a tool for Unity that exposes additional settings for UnitThe central environment in RedFrame is a large mansion. While developing the 3d model of the house I didn't pay much attention to its total resolution; I wanted to see how far I could push mid-range hardware and didn't want the design of the environment to be influenced by technical considerations. To our delight the house runs completely smoothly on an ATI Radeon HD 5770 with a gig of video memory. Although this video card is no slouch, it's also not a high-end gaming GPU. The resolution of the house model was originally 1,371,298 vertices. We're going to expand the environment quite a bit and will need to keep the game playable on as many systems as possible, so I've started the process of reducing the resolution of the Maya model as much as possible without negatively affecting the way it's perceived by the player. I realized that a lot of our detail was unnecessary; some of the tight detail even detracted from the image by causing flickering when anti-aliasing was disabled. The scene is quite large, so prioritizing my time is a little difficult. My first thought was just to go through each room looking for objects that are more detailed that they need to be, but this is somewhat arbitrary. My second technique has been to print a list of all objects in the scene and then order them by how much resolution they have. It is still arbitrary in a sense, but it has been a nice weapon with which to attack the problem. Because I'm more comfortable programing in Unity than in MEL, I wrote a C# script to sort models by resolution. It's my first time using Linq, which I still need to wrap my head around. You can download the script here - just import your model into Unity, drop it into a new scene, and attach the script to the model's root game object. RedFrame's lighting tends to look a bit different than most games. We achieve this unique look by generating most lighting externally using techniques inspired by pre-rendered architectural visualization. We set up and bake our lighting in Maya and Mental Ray rather than leveraging Unity's built-in lightmap rendering tools. Our current workflow is a three-step process: generate lightmap UVs, bake direct and/or indirect lighting, and import the resulting lightmap images into Unity's existing lightmap system. In Part 1 in our series on lightmapping we'll explore the process of generating lightmap UVs. Unity includes an automatic lightmap UV generation tool. This is a one-way process, and it would be impractical to transfer these UVs back into Maya. Regardless of this limitation, we take a philosophically different approach in our workflow. Where Unity embraces automated simplicity, we've chosen manual control. Our workflow produces two important advantages for us: it creates model files that contain intrinsic lightmap UVs that may be used by other applications and engines, and it offers deep control over how objects are divided at a face level which can produce higher quality results with fewer visual artifacts. We begin our process of building lightmap UVs by merging environmental geometry into localized groups. The objects in each group will all share the same lightmap texture. Each of these groups are about a quarter the size of a room. To optimize the use of texture memory in Unity, we don't want to generate lightmaps for every individual piece of geometry. Separate objects are able to share a single lightmap provided that none of their UVs overlap. To ensure that the objects share a unique UV space, we temporarily merge every object within a group into a single mesh. Once we have a single mesh for a group of objects, we first must create a new UV set for the mesh. We will want have individual control over the UV layout for both the color and light maps - the second UV set will be used for lightmapping. In the newly created UV channel, run an automatic UV generation in Maya. This is done by selecting Create UVs -> Automatic Mapping from the polygon menus. The UV map that is generated is usually fairly efficient but it can be compacted further by cutting UV edges that form right angles and then running a Layout operation. 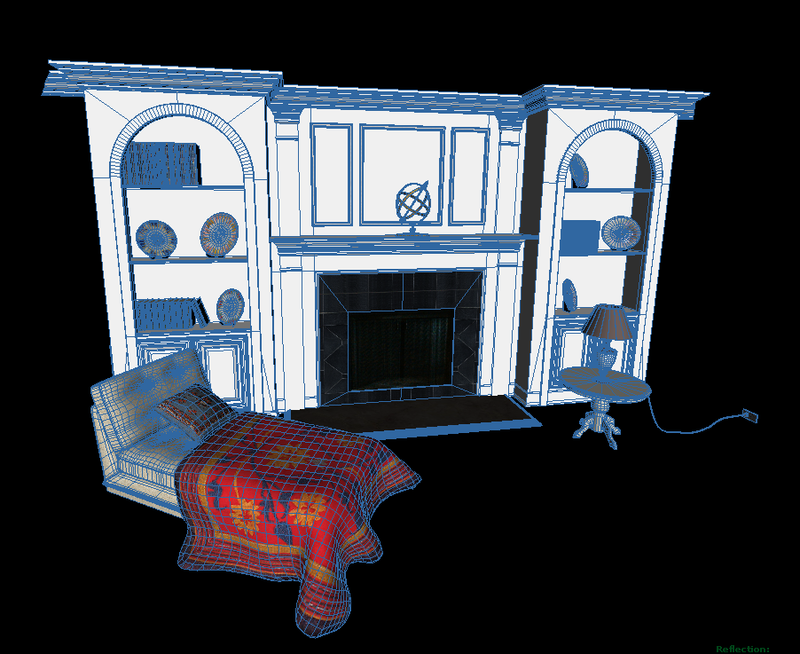 Manually separating UV shells for smooth objects with hard corners such as crown molding, or softer organic shapes such as upholstered furniture, can also minimize artifacts in lightmaps. Artifacts can be further reduced by tweaking the position of individual vertices as needed. Once the mesh containing a group of objects has had its UVs efficiently laid out, we break the mesh into smaller pieces so that they can be culled by Unity via frustum culling and occlusion culling. The most sensible way we've found to re-divide each group mesh is by material. We wrote a MEL script to automatically do this, and we've made it available here. This script will separate a mesh into pieces based on its materials, and will place each piece into a group node containing all meshes that share the same lightmap UV space. The script is a little ad-hoc and will break if one of the contained materials is the default material. Any suggestions on how we might improve the script are welcome. Unity uses two UV channels per mesh, the first for displaying color maps and the second for lightmaps. When importing a model, Unity will automatically read the mesh's second UV channel. Be certain to disable "generate lightmap UVs" in the model's asset import settings, otherwise Unity will overwrite the UVs that were manually laid out in Maya. RedFrame is an exploratory adventure game in production by Andrew Coggeshall and Michael Stevenson. Weve been working on RedFrame in our spare time for more than two years, but until now weve largely kept our work under wraps. Wed like to begin sharing with you what weve accomplished so far, and what still lies ahead as we continue crafting the world of RedFrame. Through this blog well be highlighting major aspects of development, giving you a peek into our process. This blog will be written from a technical perspective and will be spoiler free. If you have any questions or comments, feel free to contact us.